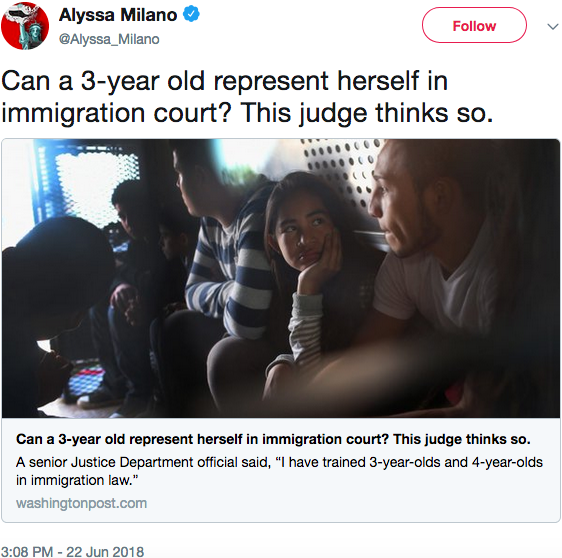 The following article—dating from March 5, 2016—in The Washington Post titled, “Can a 3-year old represent herself in immigration court? This judge thinks so.” is now making the rounds across the Internet in light of current U.S. immigration policy that is separating parents from children. Screenshot of actress Alyssa Milano’s tweet—which is where I first learned about this—at the bottom of this post for reference. But as odd as these claims are, I can’t seem to find a solid context for the deposition for the quotes provided. And the article itself almost glosses over the details and specifics past the shocking quotes. So that said, are there any primary sources—or solid secondary sources—that can provide a clearer context for these quotes and claims? Q. It must be true that there's some children that are so young that even if they receive the notice and even if they're given an explanation by the judge, they're still not going to understand what's going on; right? A. I have to do a case-by-case basis determination. I've taught immigration law literally to three year olds and four year olds. It takes a lot of time. It takes a lot of patience. They get it. It's not the most efficient, but it can be done. Q. I understand that you think it can be done. Are you aware of any experts in child psychology or comparable experts who agree with the assessment that three and four year olds can be taught immigration law? A. I haven't read any studies one way or another. Q. What about like a one year old? A. I mean, I think there's a point that there has to be communication. There has to be communication at some point. Q. So what do you train judges as to cases in which communication is impossible because the child is too young? A. What we train is if a respondent, child or adult, cannot perform functions necessary for the hearing to be fair, the judge should not proceed. Q: Can you imagine a case where there isn't an attorney and the case is very complex, the child is very young and capacity is very limited where there's no safeguard, short of representation, that would allow the child to get a fair hearing beside obviously stopping the case? A. You're asking me to speculate about a fact pattern that -- I've already told you that a large majority, almost -- a large majority have an adult present. I've told you about all the resources we have. I don't know whether -- in those cases, in every case, an immigration judge can slow down and spend a lot of time and continue the case. I've told you I have trained three year olds and four year olds in immigration law. You can do a fair hearing. It's going to take you a lot of time. But I really think that a great alternative to terminating a case for a child who may be eligible for relief where there's no counsel is proceed very slowly, very carefully, and I'm going to tap every single resource I can to see if I can get the some help. Not the answer you're looking for? Browse other questions tagged united-states law immigration .